I swear there is a time thief that each of us has haunting our days and starving us and stressing us for the lack thereof. There is so much to do it seems these days. I remember when I had time to drop in on neighbours and visit and other times when I had too much time on my hands and actually didn’t know what to do to occupy that time. Weird to think of now. 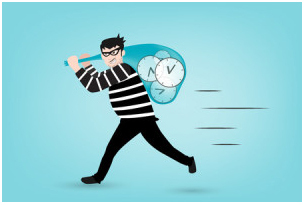 You want to steal back or buy some time to do WHAT? What do you actually want this extra time for? This is very important to define because then it will define the importance to you, how much time you actually want, and allow you to work towards this goal. It doesn’t matter if it is a half hour per day to stare at the sky and make wishes or plans or create, or maybe to go horseback riding, or golf a full 18 holes once a week, or play with your children for 1 hour each day uninterrupted by any other activity. You are the boss of what you want. Now you need to diarize it … and you may need to be ruthless about this. It is your time and you mustn’t let the time thief steal it from you. The next step may be looking at how to handle any other activities you bumped out of the way and diarize those. Look for inefficiencies or unnecessary actions that are really not that important and knock them out of your day or life. We often have many time wasters and need to re-evaluate importances and systems. Some people have to learn how to delegate duties to others that should be shouldering some with you. Give yourself a gold star on your calendar every time you keep that time you set aside as in Step #1 above. Have fun with this and forget time poverty … be TIME RICH! 4 Ways to Increase Patient Referrals Is It Time to Move?